Jack White’s Third Man Records, though headquartered in country capital Nashville, boasts a truly diverse catalogue of artists spanning multiple genres. If anything, White’s label pursuits lean, unsurprisingly, towards rock. However, one Third Man artist has been making some big waves in the country industry over the past few years: Margo Price. Price has released both of her first two albums, plus an EP, since 2016, and right now she’s touring behind the latter of those, All American Made, which came out last October. She played a sold-out show at the Ryman Auditorium on Saturday, played one more on Sunday and will conclude the three-night headliner on Wednesday. On Saturday, Sturgill Simpson joined her onstage, and, on Sunday, White himself made an appearance. You can watch both live collabs go down via fan-shot footage below. No word yet on who’ll crash Wednesday’s show. Simpson joined Price for a mostly by-the-books rendition of the classic country duet “After the Fire is Gone,” recorded first by Loretta Lynn and Conway Twitty in the ‘70s. Simpson also assisted opener Tyler Childers for a song. 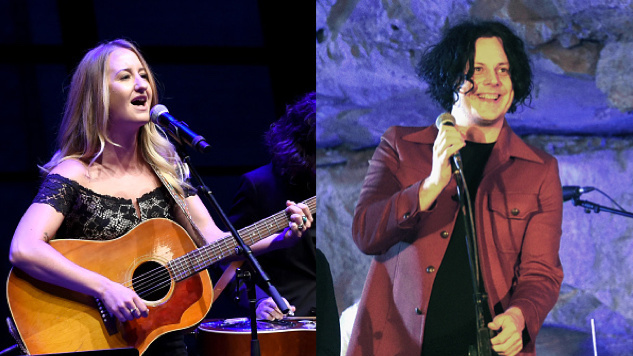 Then, on night two at the Ryman, Price and White sang The White Stripes’ “Honey, We Can’t Afford To Look This Cheap,” a song White said is about “songwriters living in Nashville.” It’s hard to imagine a more appropriate tune to perform for a crowd of eager Nashvillians. Price has quite a few tour dates stacked up for the summer, including a set at the Newport Folk Festival. You can find all Price’s tour dates on her website. Read more about Price in our Best of What’s Next write-up from 2016, and revisit her 2015 Daytrotter Session further down below.